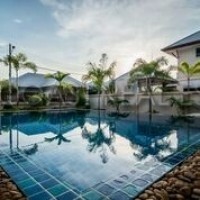 A 3 bedroom 2 bathroom house on a plot size of 45 TWAH at The Ville village in East Pattaya. The Ville Jomtien. A newly constructed village, located just a couple of minutes from Sukhumvit, just south of the busy Pattaya traffic. Easily accessible to all parts of the cities, and all the supermarkets and attractions of the surrounding area. The village has just opened a new club house and tennis courts along with providing communal swimming pool, 24 hour security and great maintenance of the communal garden areas.